Lance Corporal (2932592),he was serving with no.3 patrol on 1.febr 1945,he was entitled 39-45 Star,the France and Germany Star,1939-45 War Medal. Group photograph GHQ Liaison Regiment, June 1944.
on D-Day, three Patrols (5, 8 & 14) landed with 3rd BR, 50th Northumbrian and 3rd Canadian Divisions. Three patrols were due to land on D Day, one with each division. Two motorcycles carried in the jeep trailer. One Jeep towing a 10cwt trailer. Carried a R107 Receiver. One M3A1 White carrying a No22 set and a R107 Receiver. On Gold (50 Division) the Jeep landed from an LCT at H+90 minutes( Patrol No.8,Captain Keith Salter,and two driver-operators,Hovey and Lane.Their task to make it to Meauvaines,a village about one and a half milles inland,to report to to 50th Division Tac HQ(citat from "Phantom at War"). with the White following from a LST after H+6 hours. Jig green: 24603/2920 LST scout car. Men of the 6th Green Howards came ashore supported by DD tanks of the 4th/7th Dragoons and the special tanks of the Westminster Dragoons. In this sector the defence was weak and the coastal strong points were easily knocked out before the troops pushed inland to tackle the German artillery batteries. The attack on Le Hamel was slow and British forces took a number of casualties. The intervention of the 147th Field Regiment, Royal Artillery, enabled the strong point to be neutralised and the village fell at approximately 1600 hrs. The 69th brigade then continued its southward advance though Creully and Crépon. At 1600 hrs a German counter-attack was launched but failed to break the British lines. The ramp was lowered and we walked ashore on dry ground. Our difficulty now was to link up with the advance party who we believed to be ashore. The beach was a seething mass of activity, with hundreds of vehicles coming ashore and making their way slowly inland. The beach was littered with all sorts of equipment and smashed vehicles. We decided to make our way to Jig beach. We were very careful to keep to the tracks, as there were still lots of mines about and R.E.’s were busy exploding them. It was now about eleven o’clock and after walking for about an hour in full kit we decided to have a rest. All our enquiries for 1026 or 6POG were without success and we wondered which way to turn. Away in the distance we could see some large buildings so Sgt. Fitchett volunteered to make his way there if I looked after the kit. He left me at about 12 noon and it was 5pm before he got back, I was getting very anxious about him fearing he had stepped on a mine. Fortunately, he had been successful and had discovered the Company’s location, which was in Meauvaines. We were advised to make our way to Crepon and then make further enquiries there, and at the same time we were warned to watch out for snipers who were very active. During that day the Pioneers had cleared all the dead bodies from the beach, so I was spared that horrible spectacle. We managed to get a lift on a lorry to the village of Crepon, and stopped at an R.E. dump. It was now after 6pm and as we had not eaten all day we decided to make a cup of tea from our 24h. pack. After a brief rest we left our big packs with a unit billeted in the field and set out to try and find Meauvaines. The road we took was littered with parachute equipment, Mae Wests, ground sheets, and all manner of equipment. We had not been walking very long when we came across two wooden crosses on the road side marking the graves of a Sgt. And L/Cpl. of the Green Howards, it made one realise the horror of war, and its utter waste of human life. After walking about 2 miles we got a lift on the back of a water cart and eventually found ourselves in the village of Meauvaines, a pretty little place lying in a hollow. No one seemed to know anything about 1026, and after wandering about the place for a long time we contacted an R.E. major who said he though they were in the vicinity. Just as we left him, who should come out of a doorway but our cook Sgt. Bonetti, I have never been so pleased to see anyone as I was to see him. The Company were juts around the corner and in about five minutes I was shaking hands with some of my pals from the Orderly room, it was a happy moment. We then unloaded our kit, and then trailed back to Crepon for our big packs. Fortunately, we met Bobbie Martin in a lorry and he gave us a lift part of the way, and then brought us back from Crepon village. It was in the latter village that a sniper had been very active, and the steeple of the church was riddled with shell holes, for it was there he was eventually discovered. On arrival back at the camp I found that Bert Sharpe and Arthur were sharing a dugout, but as Arthur was on night duty at Group I was invited to share the dugout. Sleep was impossible for a long time owing to air raids, and I found the ground very hard. On Sword (3 Division) both vehicles landed from LCTs at H+285 minutes. On Juno (3 Canadian Division) the patrol could not land at all on D Day but did so on D+1. In all cases the patrols started listening to contact detachment nets and command nets while still at sea about H-2 hours. Reports were sent back to the UK by the 22 set. The British troops landed at 7:20 on Gold Beach, where their experience was completely different from that of the Americans at Utah and Omaha. Unlike those landed sites, the British had little actual beach to cross. After they surmounted the seawall and an antitank ditch, they were into villages with paved streets. Beyond the villages were mostly large wheat fields. They also faced almost no enemy fire and had an orderly landing that went largely according to plan. A total of 25,000 troops stormed Gold at a cost of 400 casualties. By the end of the day, the British had advanced five miles beyond the coast. 07.25 – The 231st and 69th Assault Brigades hit the beach. DD (swimming) tanks and beach clearance groups, delayed by bad weather, are landed directly on to the beach. 07.45 – Troops make slow progress against raking fire, but three beach exits are cleared within the hour. 08.20 – Follow-up battalions and No. 47 Royal Marine Commando land. 09.30 – Les Roquettes is captured. 09.50 – Stiff resistance at Le Hamel. Commandos head for Port-en-Besin to link with American forces. CSM Stan Hollis, 6th Green Howards, performs acts of bravery at Crépon for which he is later awarded the Victoria Cross. 10.50 – Reserve brigades begin to land; seven beach exits have been secured. 16.00 – Le Hamel is finally captured. 231st Brigade moves on to Arromanches. 69th Brigade encounters resistance in Villers le Sec/Bazenville area. 20.30 – 56th and 151st Brigades reach the outskirts of Bayeux and the Caen-Bayeux road. 21.00 – Arromanches is captured. 23.59 – A large bridgehead has been established, six miles wide and deep, linking up with the Canadians at Juno Beach. 47 Royal Marine Commando are ready to take Port-en-Bessin on the following day. By midnight on June 6, the 50th Division had landed 25,000 men with approximately 400 casualties. They had penetrated 10 km (6 miles) inland and met up with the Canadians coming from Juno Beach at Tierceville. The 56th, 69th and 151st Brigades had dug in on a line between Vaux-sur-Aure and Coulombs. During the evening, patrols of the 2nd Gloucestershires reach the outer suburbs of Bayeux. To the west, Arromanches is reached at 2000 hrs and cleared an hour later. The link-up with the American troops cannot be made. Men of the 47th Royal Marine Commando, after a day-long progression into enemy territory, had dug in on Hill 72 south of the Longues-sur-Mer battery. Their objective, Port-en-Bessin, did not fall until June 8. The assault on Gold Beach starts at 0725 hrs on the King sector. Men of the 6th Green Howards land, supported by the DDs of the 4th/7th Dragoons and the special tanks of the Westminster Dragoons. In this sector the defence is weak and the coastal strongpoints are easily reduced before the troops push inlands to silence the german batteries. On the Jig sector, the assault companies of the 1st Hampshire land at 0735 hrs without the supporting tanks which have been delayed. The attack of Le Hamel is stopped cold, progress are very slow and the losses heavy. It will take the support of the 147th Field Rgt, Royal Artillery to reduce the strongpoint which falls at 1600 hrs. The 69th brigade can then continue it's advance south though Creully and Crépon. At 1600 hrs a german counter-attack is launched that shakes the british lines but fails to break though. On the evening of June 6, almost all of the 50th Infantry Division's objectives have been reached and the Gold Beach bridgehead can be considered one the strongest established. To the east, the junction is made with the canadian troops south of Tierceville and the 69th, 56th and 151st brigades dig in on a line between Vaux-sur-Aure and Coulombs. During the nights, patrols of the 2nd Gloucestershire reach the Bayeux suburbs. To the west, Arromanches is reached at 2000 hrs and cleared an hour later. The link-up with the american troops can't be made. Men of the 47th Royal Marine Commando, after a day-long progression in enemy territory, dig in on hill 72 south of the Longues-sur-Mer battery. Their objective, Port-en-Bessin, won't fall until June 8th after some heavy fightings. At the end of the day, 25,000 british soldiers have landed on Gold. 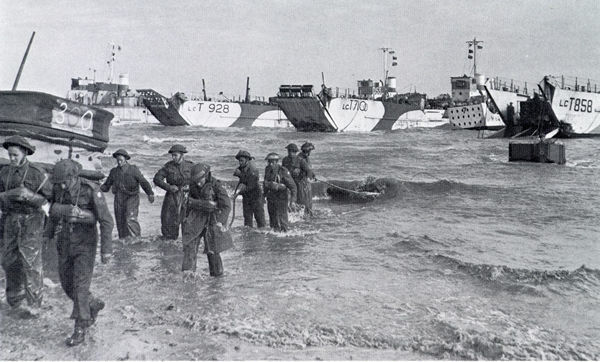 413 men have been killed or wounded on the beach and 89 landing crafts have been destroyed. During Operation Overlord, in June 1944, many patrols from Phantom came to Normandy on D+1 (7 June 1944). One patrol was assigned to each Divisional HQ of 1 and 30 Corps to land with Main Divisional HQ. Thus on D-Day, three Patrols (5, 8 & 14) landed with 3rd BR, 50th Northumbrian and 3rd Canadian Divisions. Their task was to go around day and night to find all the British, Canadian and American units they could, marking their locations on a map, and passing the information to the main HQ. During Operation Market Garden, in September 1944, a Phantom patrol provided some communication and liaison between forward units and HQ. Two Phantom officers were subsequently awarded the Military Cross for maintaining these important lines of communications during the operation. This book describes the role of GHQ Liaison Regiment, better known as Phantom, during Operation Market Garden. The information in the book is based on considerable primary source material from former serving members of GHQ Liaison Regiment. The unit had patrols with 1 Airborne Corps HQ, Second Army HQ, 43 British Division, 1 Airborne Division, US 82 Airborne Division, US 101 Airborne Division and 52 Lowland Division. The Phantom net by 23 September provided the only Wireless link between 1 Airborne and the Second Army/1 Airborne Corps. Second World War British Army unit badge for GHQ Liaison Regiment (also known as No. 3 Air Mission and, later, as 'Phantom' Regiment), embroidered on felt, H 1.9in x W 1.5in. Unit note: formed in September 1939 as No. 3 Air Mission under command of Wing Commander J M Fairweather, its role was to pass on information about the position of Belgian and British troops in Belgium from Belgian GHQ to HQ Advanced Air Striking Force for the purposes of avoiding friendly fire incidents. Fairweather and an attached Army officer, Lt. Col. G F Hopkinson ('Hoppy'), realised that the resources of the Mission were inadequate and in February 1940 Hopkinson was put in charge of his own Mission which was tasked to work with No. 3 Mission. It seems that the Phantom name dates from this time. The unit's role evolved into the provision to the higher command of immediate intelligence on the current situation and intentions of our own forces. It was dubbed in the immediate post-war popular press as 'the eyes and ears of the Commander in Chief'. An official definition of its function was 'to transmit vital information from the battle front, ignoring the usual channels, to the Commander able to dispose of the vital reserves.' In practice this involved a headquarters dealing with intelligence and signals and a number of squadrons made up of officer patrols. These toured forward areas and attended senior commanders' orders groups and then reported back direct to Phantom HQ which was co-located with the appropriate higher command HQ. As an adjunct to their contact work the unit also monitored our own signals traffic, a task previously undertaken in the Middle East by a separate organization called the 'J' Service. By about 1943 Phantom units included a 'J' signals surveillance capability. By the end of the Second World War there were two full Phantom Regiments, one each in Italy and North West Europe, with a third forming for service in the Far East. Asher Pirt is researching and writing a definitive history of GHQ Liaison Regiment during the Second World War. He is extremely keen to hear from former members of the unit better known by its codename Phantom. He is constantly on the lookout for private papers, unpublished photographs and associated material to improve his understanding of the unit. Asher's History of the unit examines the background of former members of Phantom, the W/T system and associated coding and Wireless equipment, the Vehicles used in training and on operations, Phantom's training for operations, Higher Command thinking about the unit and finally how Phantom distinguished itself on a variety of Operations in the Middle East, Central Mediterrean and North West Europe. An article by Asher appeared in the magazine Medal News which is a useful introduction to the unit's war service.